Perhaps you have been in denial for a while that mom is not managing her finances very well. Dad always managed the checkbook and paid the household expenses. Now that he is gone, she seems exhausted. She has let a few bills slip by, and late notices are showing up in her mailbox. Your mom may be too tired, physically drained, or mentally unable to handle her financial matters, perhaps, her legal and medical decisions too. You may need to step in to help her. Has your mom designated a power of attorney? To safeguard your family and to aid your mom in her financial, legal, or health decisions, it is essential to meet with a lawyer and determine a power of attorney. The specifics of the law can vary from state to state, but the general concept is the power of attorney allows a caregiver or loved one to make legal decisions for someone who is unable to make these crucial decisions on their own. A power of attorney is a written document that allows legal, financial, and real estate matters to be handled by someone that they designate and trust. Based on your mother’s wishes, a power of attorney can handle all of your mom’s legal and financial concerns, or they can be appointed to make decisions on one or several specific issues. As an example, your parent may want you to be her healthcare power of attorney, where you are responsible for decisions regarding her medical care. Or your mom might elect to designate you as power of attorney with the responsibility of her healthcare, finances, and property needs. It’s important that the designated power of attorney is present with their parent and lawyer when these details are outlined and explained, so everyone is clear about expectations and responsibilities. Once the power of attorney documentation is signed, the agent (caregiver or family member) is responsible for keeping a close record of any financial transactions made on your mother’s behalf. You and your mom also need to have a clear understanding of the types of decisions—financially, legally or regarding healthcare—that she can make for herself. 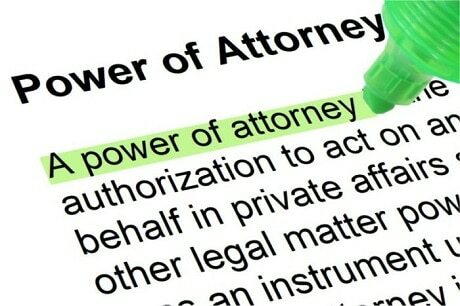 Who is the agent in a power of attorney? The power of attorney is anyone 18 years or older who can handle the responsibility of making important decisions for your mom. The power of attorney is referred to as the “agent” in documentation, and the senior is called the “principal.” Often agents for the power of attorney are adult children, a spouse, relative, or trusted friend. The U.S. judicial system does not manage, regulate, or monitor the power of attorney, so selecting someone who is trustworthy is important for your family to consider. And your mother should work with a lawyer to include specific language regarding all matters she is handing over to the agent. Designating and establishing a power of attorney is a good idea for any senior. But if your parent is diagnosed with dementia and a power of attorney has not been decided, their legal planning needs to begin immediately. Start by finding a competent lawyer who understands the parameters in your state. The Alzheimer’s Association recommends meeting with a lawyer as soon as they are diagnosed so they can participate in the financial and future planning if possible. An educated lawyer to help guide your family to setting up a power of attorney is a crucial first step. This area of the law is an expertise that you should specifically seek out, particularly for those with Alzheimer’s or another form of dementia. Lawyers with expertise in elder law can assist not only with the power of attorney but address other issues your parent may face, such as assisted living care, finances to cover future health care needs, estate planning, and assistance with Medicare or Medicaid. If you need help with finding an appropriate lawyer, there are several organizations, including the National Academy of Elder Law Attorneys, that can help direct you to an expert in your city or contact your family lawyer for recommendations. Hiring an expert lawyer in the field will ensure your parent’s health, well-being, and legal matters are correctly taken care of. Having your parent set up a power of attorney can bring them peace of mind. In the event they cannot make decisions for themselves, they can rest assured that they have set up a trusted family member or close friend who can make decisions on their behalf. Their future should not be something that is left to chance, but a decision made while they are able to participate in and plan for. If they want their financial and medical decisions to be understood and fulfilled, then setting up a power of attorney who understands their wishes is essential.